The best outdoor beer growler is a popular container with easy to fill,wide mouth and lid design. They are mostly made of quality stainless steel material for durability and high performance. These bottles are available in different sizes and capacity. However, most growlers have a liquid capacity of approximately 2 liters. 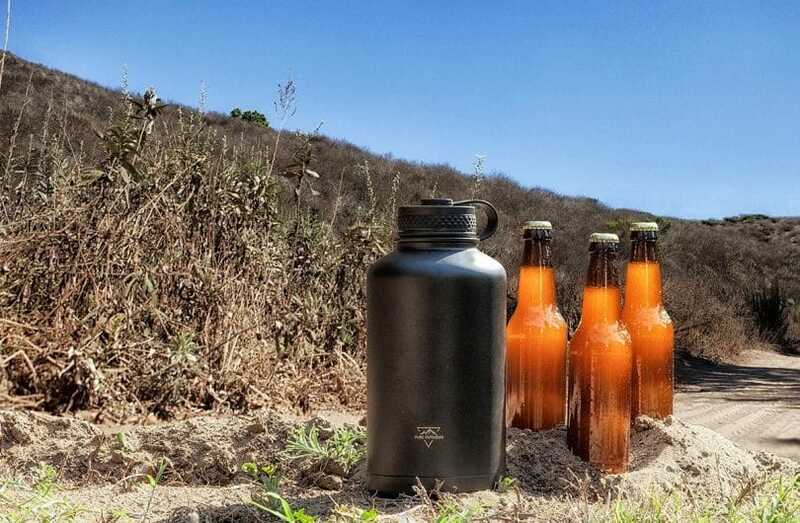 Unlike traditional bottles, beer growlers are actually designed to be used outdoor. Some growlers are remarkably elegant, which can be used as gifts. The list of product reviews provides you with valuable buying information, and tips for future purchases. The material is not usually an issue because all growlers are made of quality stainless steel material. However, the construction is what matters a lot. This normally involves the wall and insulation. Single wall construction is lighter and does not have vacuum insulation. Therefore, you cannot use it for hot drinks. A beer growler with single wall design is only convenient for cold drinks. The best design is double wall construction with vacuum insulation. 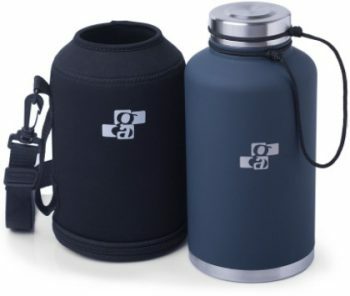 An insulated beer growler can be used with cold as well as hot drinks. Most insulated bottles can keep your drink hot for twelve hours and cold for twenty-four hours. They can also be used to store iced drinks. Always make sure the bottle has aproper finish, such as matte powder coated finish, which ensures the bottle is sweat and condensation free. The best beer thermos is one that has no plastic contact. An inner steel lid is not only easy to clean, but also ensures that the bottle is airtight. You can also consider swing caps; they are easy to open and close. 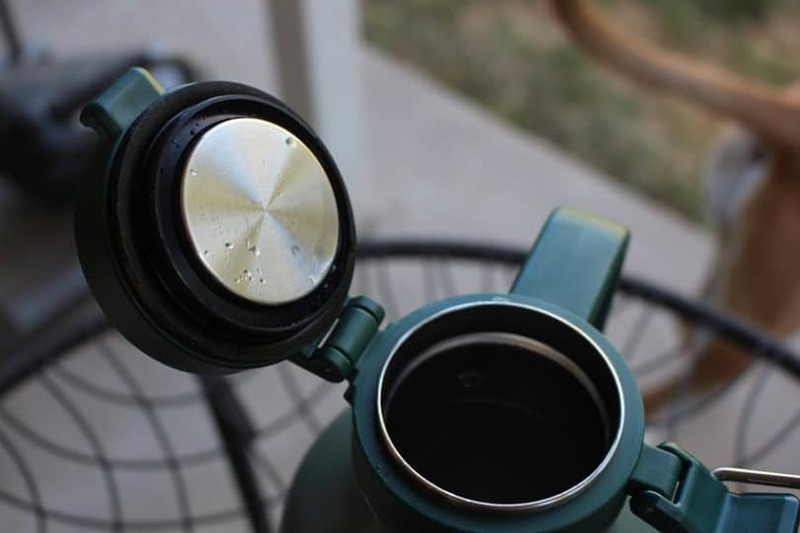 The handle may not play a bigger role in ensuring that your drink stays hot or cold, but it is certainly necessary for one hand pour, easy carry, easy pouring, and easy drinking. Nevertheless, the one hand handle is not a feature that is found on every insulated beer growler. There are some that have the lid and the bottle neck attached by a string. When you screw the bottle, you can use the string for easy carry. Also, make sure the neck is considerably wide for easy pour, drinking, and cleaning. With that said, your purchasing decision should be based mainly on the construction: double wall or single wall. However, the handle design, exterior finish, and durable lid profile are also important considerations. 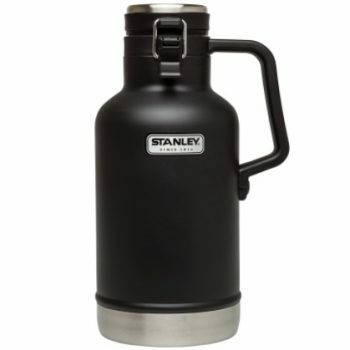 Stanley Classic Growler is not just a beer container; you can use it to keep other liquids cool, such as iced tea or lemonade. It is made of 18/8 stainless steel material, which is remarkably durable and rust free. This material makes the jug naturally BPA-free. Like all Stanley products, this classic growler is warranted to be defect-free in material as well as craftsmanship. This makes it endlessly thermal efficient. It has a capacity of 1.9 liters, which can keep a drink hot for eighteen hours, iced for a hundred hours, and cold for twenty-four hours. The design is integrated with vacuum insulation that ensures your beer or drink stays cold, iced, or hot for the desired amount of time. There is no plastic contact on the inner steel lid, which makes cleaning easy, ensuring that there is no dirt or stain that may interfere with the taste of your drink. The one hand pour makes it easy for you to handle as well as pour a drink. The durable construction makes it dishwasher safe for hassle-free cleaning. The Brew Tanker is what you need when going camping or partying with friends. The body is made of 18/8 stainless steel material, which is attractive and unique. This stainless construction is environmentally friendly, and BPA free. It is integrated with double build for keeping your beer and other drinks cold. The double wall also ensures your hot beverage stays hot for as long as possible. In addition, the bottle’s design is installed with thermal insulation barrier that makes sure your sweating hands do not interfere with the state of the drink. 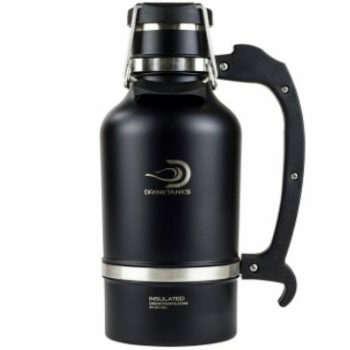 It provides you with 64-ounce capacity for carrying your beer or any other drink to a party or camping. 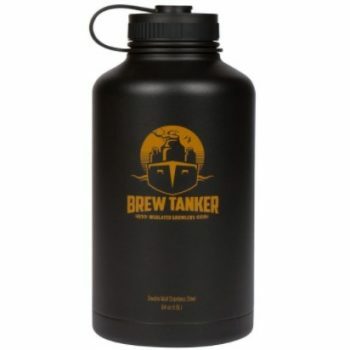 This is the ideal growler if you are a big fan of drinking outdoor. Try it out when hiking either in the wild or down the beach. You should not carry your drink in ordinary bottles, which will not keep it cold or warm until you are ready to drink. 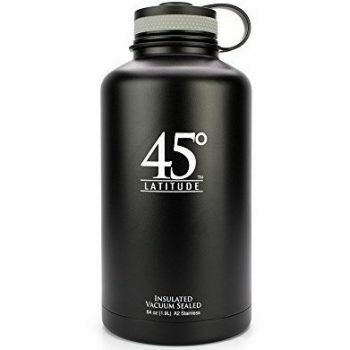 This 45-Degree Latitude Growler is designed to keep your drink hot for 12 hours and cold for 24 hours. The design is made of stainless steel, which is BPA free and highly environmental friendly. The bottle has vacuum insulation, which ensures your beer stays cold and fresh for considerable time duration. This ensures the carbonation of your brewstays the same, thus maintaining the original taste hours ahead. 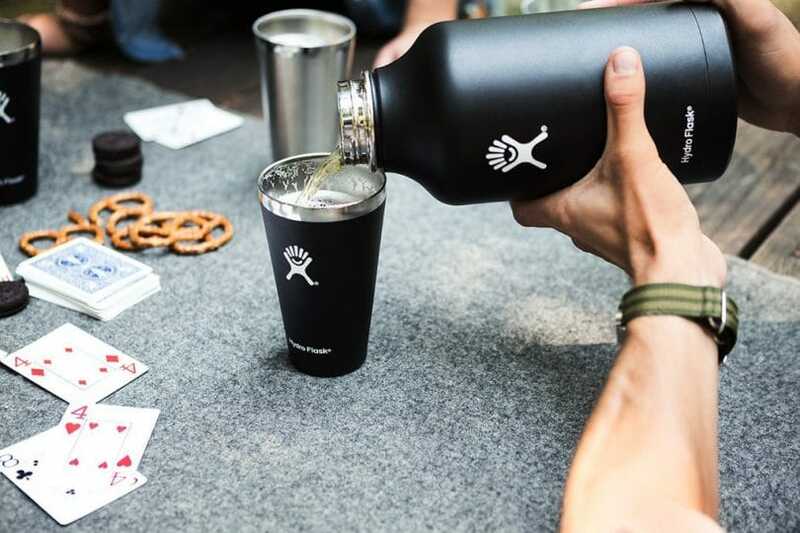 The sturdy powder coat finish safeguards the drink’s temperature from sweating hands. You can conveniently personalize your growler with six different color bands. You just have to detach the cap, then remove the current band, and slide in the new one. You can carry the jug by holding the strapping that attaches it to the lid when it is empty. Stainless Steel Beer Growler is a beautifully designed growler. It is engineered from 18/8 stainless steel material, which is not only durable but also easy to clean and maintain. The exterior surface is passivated; a feature that guarantees your drink’s flavor will stay fresh at all times. The exceptional swing top ensures your cocktail remains fresh. However, the benefits of this growler are limited because stainless steel construction is not incorporated with vacuum insulation. Therefore, it is not convenient for acidic materials, nonfood, or hot liquids. You have to limit the use of this growler to beer, water, and drinks. 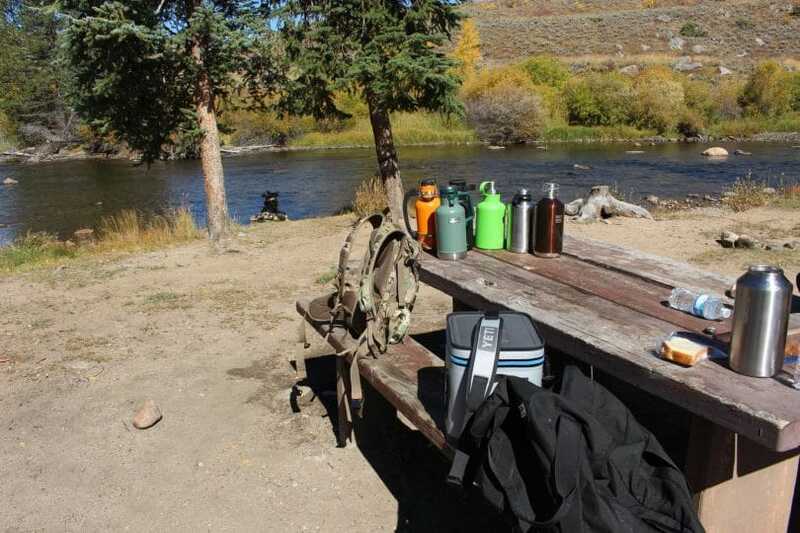 In actual fact, it is the best for storing cool water when hiking in summer. The mouth is slightly larger for easy pour and drinking. The only problem is that it is hard to sight beer level when filling the growler, but you can always estimate. 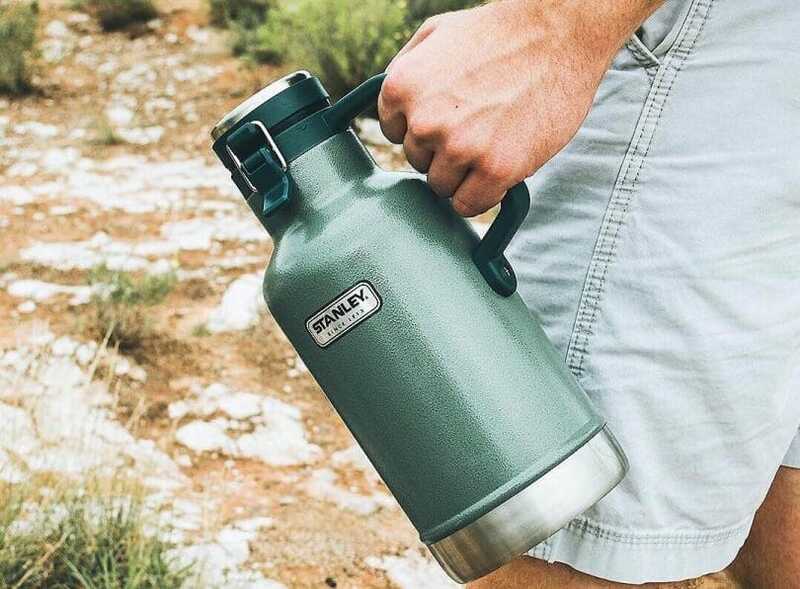 If you are in search for a lightweight growler for ultra-backpacking, then PROKEG is the ideal choice.It is made of lightweight stainless steel material that is durable and keeps your drink fresh at all times. This is not the best jug for those who want to carry hot drinks. This is so because it is made of a single wall which is non-insulated. This is a convenient build for outdoor people who want to carry cold drinks, such as beer or lemonade. The cap is flip top and it is incorporated with silicon gasket for improved carbonation retention. The elegant design makes a good gift. You can get this model for your husband, wife, and friend not only for carrying beer but also for keeping drinks cold, such as lemonade. 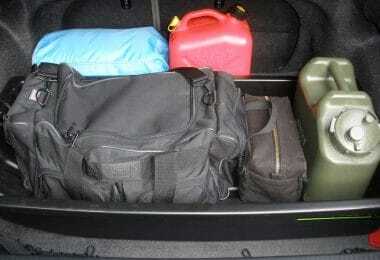 The 2-liter capacity is more than enough for any outdoor adventure. The only concern that you can probably overlook is the absence of a handle. 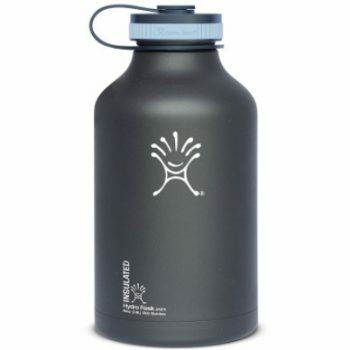 Hydro Flask is one of the best stainless steel beer growler and water bottle. 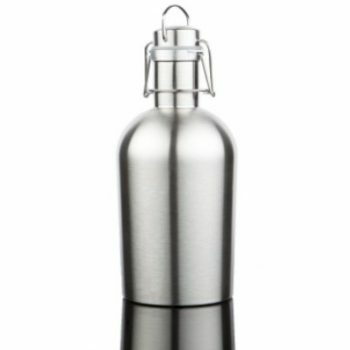 The 18/8 premium grade stainless steel is lightweight, durable, and keep drinks hot or cold. The build incorporates a double wall with vacuum insulation, which keeps drinks hot for about six hours and cold for about twenty-four hours. Do not be worried about sweating while holding the bottle because the exterior surface is coated with powder matte finish. It has a beautifully curved neck with ablack lid and small extension beneath the lid that you can use as a handle. You will admit at first glance that the design is elegant. 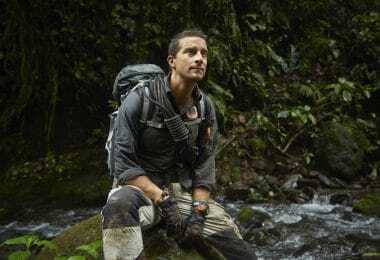 In fact, it is the perfect gift you can get your hiking or traveling buddy. The round flat bottom settles comfortably on a flat surface. It is also the ideal size for most backpacks with bottle storage. Generally, this bottle’s performance will surpass your expectations. DrinkTanks growler is the masterpiece as far as stainless beer bottles are concerned. 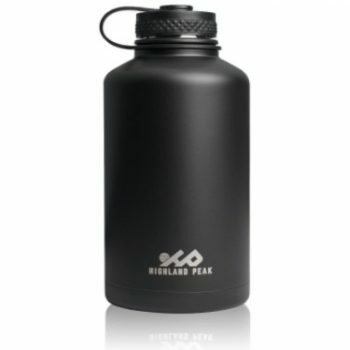 This matte black 64-ounce bottle has a rugged durable build engineered from 18/8 stainless steel material. Its double wall construction has vacuum insulation that ensures your drinks stay cold for about twenty-four hours. The exterior surface has a matte black finish, which ensures there is no condensation due to sweating hands. The design has heavy-duty double bail system which offers a tight closure which guarantees no leakage. It has an optional keg cap, which is sold separately. The lid is injected with CO2 for longer beer preservation. It comes with a highly ergonomic handle, which allows you to hold the bottle whether it is empty or full of a drink.It is available in different finishes, including matte black, stainless steel, matte yellow, matte teal, matte red, matte plum, matte olive, matte blue, gunmetal, gloss sea foam, gloss raspberry, gloss pearl, gloss orange, gloss green, gloss brown, and copper. 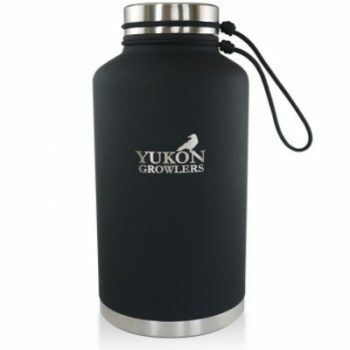 YUKON growlers are the best as far as outdoor bottles are concerned. The very first thing that will surprise you is the 304 stainless steel construction. It has double wall construction with vacuum insulation that ensures your drink stays hot for around twelve hours and cold for twenty-four hours. This material is highly durable; it ensures that your beer or lemonade is chemical free. The bottle is incorporated with a silicone gasket reinforced steel cap that ensures there is no leaking. The black finish is condensation free; no worries about sweating hands. Apart from being condensation free, the black rubberized coating can be labeled easily with a chalk. You can differentiate your beers by labeling the bottles with a chalk. There is an elegant string that attaches the neck and the lid. You can easily carry the bottle around when hiking by holding the string when the bottle is closed. 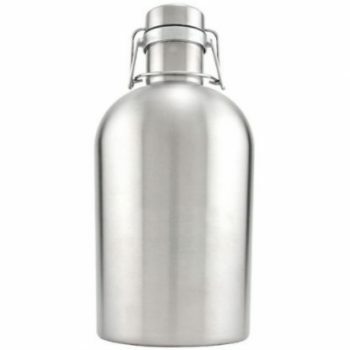 If you have been searching for a very reliable, sturdy, and stylish bottle / growler for outdoors, then look no further than this beautifully constructed Stainless Steel Insulated Growler. It is engineered from high grade stainless steel, which is very effective as far as keeping your drink cold and fresh is concerned. The 64-ounce liquid capacity along with the vacuum seal confirms that there is no air leaking out of the bottle once you have poured in your beer and lock the lid airtight. Unlike most growlers you will find in the market, this one has a wide neck. The wide neck is very effective; it allows easy filling, pouring, and drinking. The wide neck is also very convenient during cleaning. In addition, the lid and the bottle are attached with a string, which you can use for easy carry. It is without a doubt an elegant growler, which qualifies greatly as a gift. It is beyond doubt one of the best 64-ounce bottles/ growlers you can find in the market. To begin with, the design is made of quality stainless steel material, which is highly durable. The growler has a double wall construction, which is incorporated with vacuum insulation. This feature guarantees that your drink stays hot for about 12 hours and cold for about 24 hours. Apart from the 18/8 stainless steel material, the jug is laser engraved, ensuring that your drink is free from bacterial growth. The 64-ounce beer capacity is more than enough for hiking, camping, and so on. The outer finish is sweatfree; this ensures that there is no condensation. It is a high-qualitybeer/water bottle that is engineered to offer you nothing but the best performance at all time. You must make sure that the bottle you are buying will serve you accordingly. This simply means that you cannot buy a single wall beer growler and expect to use it for hot or iced drinks. Irrespective of the fact that single wall beer bottles are ultra-lightweight, they are not highly convenient. Go for an insulated bottle with a few extra features, such as one hand pour handle, and a no plastic lid. Do you think we have missed any important growlers? If so, please let us know in comments.